Some of the last data from the Cassini mission reveals more structure in Saturn's magnetic field, but still no answer as to how it formed. NASA's Cassini mission—with Imperial kit on board—took a series of daring dives between the planet and its inmost ring in September 2017 before burning up in the planet's atmosphere. A first analysis of the data from the magnetometer instrument, built and run by Imperial College London physicists, shows that the planet's magnetic field has a tilt of less than 0.01?. The results are published today in a special issue of Science reporting the first end-of-mission results. This tilt sustains currents in a liquid metal layer deep inside a planet—on Earth this is a liquid iron-nickel layer around the solid iron core, and on Saturn it's believed to be a metallic hydrogen layer surrounding a small rocky core. Principal investigator for the magnetometer Professor Michele Dougherty, from the Department of Physics at Imperial, said: "Each time we more accurately measure the tilt of Saturn's magnetic field, it gets smaller, until now we are in a position where it is smaller than a hundredth of a degree. This is in sharp contrast to the Earth's magnetic field tilt of 11 degrees. "It may still be that Saturn's turbulent atmosphere of thick gases is obscuring some of the magnetic data, but it looks increasingly likely we will have to rethink the ways different kinds of planets can form magnetic fields." There also seems to be an electric current flowing between the inner ring, the D ring, and the planet. The rings cut across the main magnetic field lines as they lie around the planet's equator, and may play a role in shaping magnetic fields generated externally from the planet. 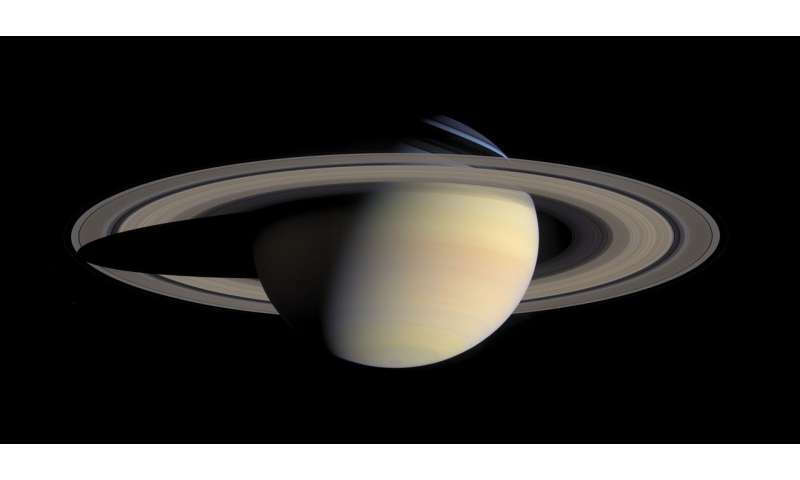 Study co-author Dr. Gregory Hunt, from the Department of Physics at Imperial, said: "There are tantalising signatures of other fields at play in the magnetic environment of Saturn, potentially influenced by the rings or by the wind patterns in the atmosphere. "Despite Cassini's mission ending a year ago, we will be digging through the data and making new discoveries for years to come." The team are looking closer at these phenomena and modelling possible structures for the interior of Saturn. They will also be combining their data with that of other instruments on Cassini. For example, combining the magnetometer data with gravity data could allow them to work out the mass, size and density of the planet's core. There also seems to be an electric current flowing between the inner ring, the D ring, and the planet. It was thought that magnetic fields around planets can only form when there is a discernible tilt between the rotation axis of the planet and the magnetic field axis. Assumed, but shown to be wrong. "Surprising mystery"? Can you say broken record? What is not surprising is the guess failed and astrophysicists are surprised. ^^^^^Ignorant fool! As if the idiots at EU predicted anything to do with this. Impossible, given that they have nobody qualified in the subject. You should take heed of RealityCheck's admonitions so that you don't come off looking like a doofus. Or is that just your nature? It just goes to show that the better the equipment and the better the observations, the fewer reasons we have to fall back on the failing 'dark matter' hypothesis and the more we see the structures of magnetic fields and electric currents do not match up to what present theory has told us Should Be Happening, but that is Not what we and our instruments see, so the theory is incorrect. The equipment Also found that there is an electrical current from the D ring to the Planet, something Jonesie has been trying to use as a strawman that could never happen, it had never been detected in the vacuum so any idea that there was any sort of current happening with Saturn's Rings HAD to be wrong, (even though they cross magnetic field perpendicularly, which means they should be performing as a dynamo) and so now one of jd's favorite 'Anti EU Rant' arguments is now gone, up and away in plasma flow like smoke. The currents "may" play a role. These are absolutely plasma ignoramuses, of course the currents play a "role". The leading role. These are the Birkeland currents powering the aurora, creating the polar hexagon, and the planetary magnetic field. "There are tantalising signatures of other fields at play in the magnetic environment of Saturn, potentially influenced by the rings or by the wind patterns in the atmosphere. There are electric currents in the rings, and those winds are evidence of currents as well. Small scale fields should be expected there as well. As an observer who doesn't interact much with the group, as soon as I saw the headline to this article I knew it would be an exchange between jonesdave and the others. And true to form, jonesdave does his absolute best to belittle everyone else. I thought the first post by RealityCheck was very appropriate. I am not in support of either side of the discussion. I am in support of open scientific research. And what the hell would you know? Never studied plasma physics have you? Sorry? Where did I say that? And what the hell have Saturn's currents got to do with DM? Stop making sh!t up. No, you and your cult are the plasma ignoramuses. You have nobody qualified in the subject, do you? Who are you, or anybody in your anti-science cult, to criticise real scientists? Is it the best you can do to label the whole of the scientific community as ignorant? Tell me, what have you, or any of the other EU idiots, produced on the current systems at Saturn? Simple answer, isn't it; nothing. Always pretending to have understood things, once real scientists have actually done the work. How about you blowhards actually beat real scientists to the drop, for once, and actually publish something of scientific value, instead of spamming your crap in places like this? No, you and your cult are the plasma ignoramuses. That said, the assumption that Birkeland currents are responsible has been shown to be very accurate. "A strong field-aligned current (FAC) system is located between Saturn and the inner edge of its D-ring, with strength comparable to the high-latitude auroral FACs." What do ya know, there's them Birkeland currents...Been saying it for years. Hard to blame Jonesdave, all he wants is peer reviews papers, and all he gets is earth orbiting Saturn, people worshiping electricity because gravity is apparently not cool enough, and people rejecting the concept of neutron stars and black holes. Oh and people who have made their life goal to rage war on a linguistic placeholder for some yet to be explained(via the scientific method & peer review) observations. Go get em Jones, just don't have an aneurysm. jonesdumb will likely "conveniently" disappear from this thread as the EU has once again been shown to be correct. But there is NO electric circuit in the solar system, which powers the Sun. This is the EU claim that has NO EVIDENCE. Ulysses found increased solar wind at the poles, but that's the opposite of what you should find if the EU theory was true. Electric circuits are not surprising on the gas giants. I don't know what cantdrive argues about. Oh I long for the days when the greatest controversy was Oliver Manuel. Already pointed out the heliospheric current circuit, in direct conflict with your statement. Circuits is how plasmas operate. cantdrive85, I can understand the ad homs from jonesdave are irritating, but you do yourself, and EU theory, no favors with responses that include words like "jonesdumb". Rather than such doctrinaire claims as "NO EVIDENCE", Old_C_Code, it would be helpful for you to refute specifically something the EU theorists have posited as evidence. That way the others on this thread could perhaps be enlightened. cantdrive says: "Already pointed out the heliospheric current circuit, in direct conflict with your statement. Circuits is how plasmas operate"
Oh BS, that's why dunderdolts has hardly any additional supporters for ten years. You don't even know basic EE, and claim we are plasma ignoramuses. There is no circuit you dope. jackie: 6 atoms per cubic meter does not make a circuit, it's simple EE. Thank you, Old_C_Code, for your measured and friendly response. Since the IEEE seems interested in exploring the EU theory, perhaps they're a better gauge of "simple EE". And pardon my confusion, but I cant't quite see how "dunderdolts" actually refutes any of the EU theory I've encountered. Of course, YMMV. 1. Plasma scarring and other plasma effects have been demonstrated in the lab fairly conclusively. The question for EU is, does it scale? 2. Neutrino oscillation is a creative way to explain the discrepancy in expected neutrinos from the Sun. If such oscillation should be detected experimentally here on Earth, it would give a big boost to the theory - however, the only experimental evidence that would be CONCLUSIVE is to measure the flavor distribution close to the Sun and compare it with the distribution on Earth. It seems to me that these days there is great conflation of "proof" and a reasonable theory. Not to be pedantic, but my understanding of science is that it is based on experiment and observation. If there is no experiment and observation, it's just tap dancing. Has a black hole actually been observed? Or have we only seen phenomena which somewhat fit the black hole model? EU theory also has a model to explain the phenomena. Why not examine them side by side and see how they compare? Well I guess since you announce it to be so from your position of ignorance, then I should listen to your nonsense. BTW, plasma circuits was put forth by Alfvén, it's not an EU thing. And Alfvén was an EE, so it would show your claims of "it's simple EE" is absolute bupkis. See the section regarding the heliospheric circuit. The plasma scaring could be billions of years old. Thousands of crater scars on virtually ALL planets and Moons,except those with high geologic activity. Even Venus, thousands of craters. So everything was hit very hard EARLY ON. Surely there was a very electrical solar system EARLY ON. 2/3 the neutrinos expected means NOTHING. There is no evidence of any path of ELECTRONS INTO THE SUN (See Ulysses Sun satellite). I think the EU is interesting and romantic, but WRONG!. candrive85 you are not and engineer, certainly not an EE, your ignorance in plasma physics is clear. Since you don't know the difference between a conductor and an insulator. Old_C_Code, I truly feel sorry for you, that your education did not provide the skills to debate and advance your point of view in a credible manner. I stumbled on this thread and thought it might offer an interesting discussion, but your middle school level snark is just pathetic - and boring. source and evidentiary supporting evidence, please? jacko you're a moron. There is no evidence to post. Bye. So you change the subject, I point to the paper 'Double Layers and Circuits in Astrophysics' written by the father of modern plasma physics which clearly shows your assumptions to be flawed. In response you ignore the post and change the subject. You seem to be unable to learn new information and process it and yet remain still stuck in your erroneous beliefs. You are no different than the Darkists in the inability to take on new knowledge and approach the problem from an alternative paradigm. Been there, done that. They simply don't have a credible alternative. Really? Where did you predict currents from the D-ring prior to their recent discovery? If you are claiming that you, or any other EU nutjob predicted the auroral currents at Saturn, then in what year did you do that? Does it predate 1983? Connerney, J. E. P. et al. Sounds to me like you are yet again appropriating the work of real scientists, and pretending that EU loons predicted it first. And, as far as I know, the hexagon has nothing to do with currents. Now, there is a fruit loop if ever there was one! Impacts are also reproduced in the lab. Check out Pete Schultz. The difference is that EU has no mechanism for this electric cratering woo, whereas we see plenty of evidence that impact cratering occurs. And what would measuring neutrino oscillation close to the Sun prove? Either neutrinos oscillate, or they don't. They have been shown irrefutably to do so. EU has no evidence of anything. ....but I cant't quite see how "dunderdolts" actually refutes any of the EU theory I've encountered. Nothing proposed by the neo-Velikovskian loons of EU can be considered a 'theory' in the scientific meaning of the word. You wouldn't even call them hypotheses. Just baseless assertions, with no evidence, and no valid scientific mechanisms. It is pure woo. "as far as I know, the hexagon has nothing to do with currents." You can generate a hexagon in a butter churn, by just churning butter, a hexagon appears on the top around the stirrer. Saw it on TV a couple years ago, lol. So I suppose a current going into the pole could be the stirrer. Wrong. And EU has never been shown to be correct about anything. Ever. "Nothing proposed by the neo-Velikovskian loons of EU can be considered a 'theory' "
Velikovsky was wrong about Venus, simply because there are WAY TOO MANY CRATERS ON VENUS for it to have formed so soon. Craters indicate age, craters from maybe a very violent electrical solar system a billion(s) years ago, that effected every satellite in the solar system. And of course Venus could not be spinning real fast as it was ejected, since it's current rotation takes a full Earth year to complete. cantdrive85, I guess I shouldn't be surprised at the Luddite attitude of Old_C_Code, jonesdave, and the rest. It's of a piece of the revelations that a great deal of results of the "research" of the past half-century or so cannot be reproduced or verified. What I find amazing is how vested these guys are in debunking EU theory. I can see them sticking their fingers in their ears, saying "Na, na, na. Can't hear you.". They sound like the other poor souls I find on the internet that seem to think over-the-top bombastic statements, with ALL CAPS, somehow constitutes an argument. Old_C_Code, I made an assertion that does not depend on EU - that oscillation of the Sun's neutrinos cannot be proved unless and until the distribution of flavors at the Sun can be measured. The distribution at Earth cannot be used as a proxy for the distribution at the Sun. Waiting for your reply. So far, crickets. Old_C_Code and jonesdave, do you even know who Richard Feynman was? Also, Old_C_Code, in the phrase "that effected every satellite in the solar system", the word you want is Affected. Kind of confirms your education, or lack thereof. Are you guys even in college? cantdrive85, have you heard of Dayton Miller? His research into the "ether" was much more comprehensive than that of the Michelson-Morley experiment. He found there was a consistent positive ether drift. Unfortunately, and in spite of all claims to the contrary, Michelson-Morley never undertook those additional experiments at the different seasonal configurations, to "avoid all uncertainty". FU azzhole. EU is as Luddite as it gets, you're just a moron. I love Feynman you idiot. You dopes think you are smart and don't even know Ohms law, you're a fraud jacko. Complete crap. Sounds like you've been listening to the idiot Scott. He's wrong. As usual. Either they oscillate or they don't. And somehow manage to oscillate in such a way as to fit pretty much perfectly with the predictions from theory. Surely you aren't thick enough to believe in this electric sun crap? Lol. if so. Whatever EU crap is, it is not science. Unfortunately for idiotic believers in aether woo, M & M weren't the only ones to do such a test. Many others have been done, and rule such idiocy out at a very high level. Yes, Feynman was an excellent physicist. He would have had nothing whatsoever to do with the neo-Velikovskian non-science of EU. ....that oscillation of the Sun's neutrinos cannot be proved unless and until the distribution of flavors at the Sun can be measured. Which just proves that you know nothing of the relevant science. All fusion reactions produce electron neutrinos! Why do you think that there was initially a deficit, as measured? Because they were only looking for electron neutrinos! Idiot. What I find amazing is how vested these guys are in debunking EU theory. There is no such thing as 'EU theory'. It is a bunch of pseudoscientific garbage, dreamed up by unqualified Velikovskian idiots. They have never been right about anything. Why are you so keen on 80+ year old data that has been shown to be wrong? And by much more modern equipment? Sounds like faith to me. So far, no one has been able to replicate Miller's results, and modern experimental accuracies have ruled them out. Bzzzt, wrong poopsie. Grasping at straws while ignoring the newest evidence shows how preconceived notions blind the willfully ignorant. Another post, another attempt to change the subject. Alfvén suggested that stars are created by the pinch effect, a natural consequence of this is this occurs along pinched Birkeland currents. Fletcher, L. N. et al. If Alfven suggested that, he was wrong. Which paper was it in? Alfven certainly believed the Sun was powered solely by fusion. EDIT: forget it, I found it. That isn't what he said. As long as magic can be invoked, but this is based upon the standard model where magic and all things dark and unseen are continuously invoked to explain just about everything. LOL! However, to most astrophysicists it is an unknown phenomenon. Indeed, important fields of research, e.g., the treatment of the state in interstellar regions, including the formation of stars, are still based on a neglect of Bennett's discovery more than half a century ago... present-day students in astrophysicists know nothing about it." The earth's QBO analogous to Saturn's equatorial ring. Worthy of discussion, especially in regards to the topological insulator model of equatorial waves. .........snipped more deification of long dead scientist........."
And? He never said that was how stars were formed. He invoked, probably wrongly, pinches to explain the initial confinement of the cloud, before gravitational collapse takes over. He never said that was how stars were formed. "Indeed, important fields of research, e.g., the treatment of the state in interstellar regions, including the formation of stars, are still based on a neglect of Bennett's discovery..."
Clearly he is sending a message, clearly you are willfully ignorant and obfuscating. You should try not under thinking everything as usual. We know there are Birkeland currents entering the poles. We know the poles are "hotter" than expected. We know from maths modeling there will be counter rotating cylinders, observed. We also know Birkeland currents create diochrotron instabilities which creates polygonal patterns. And we measured the continuation of those Birkeland currents at the equatorial region. To continue to claim this is a "meandering jetstream" requires numerous related phenomena to be ignored and trivialized. ............In Part II......magnetic compression may be the main mechanism for forming interstellar clouds and keeping them together. Part III treats the formation of stars in a dusty cosmic plasma......A reasonable mechanism is that the sedimentation of "dust" is triggering off a ***gravitationally*** assisted accretion. Learn to read, and quit with misrepresenting the words of a late scientist. Sod all to do with any electric sun idiocy. .....................................Birkeland currents at the equatorial region. To continue to claim this is a "meandering jetstream" requires numerous related phenomena to be ignored and trivialized. What is being ignored? Point me to where this is written up, and I'll consider it. Sounds like woo to me, but I'm prepared to be convinced otherwise. By real science, from real scientists. Yes - that stars form from gravitational collapse, and are powered by fusion. Not difficult to find Alfven saying that. As for the rest, I suspect I own, and have read (and understood) more of Alfven's papers than you. You seem to have the usual sound bites that all the EU loons I've encountered have. "Alfven said....yada, yada, yada." Breaking news. He also said a bunch of things that are completely contrary to EU idiocy, and he also got a bunch of stuff wrong. No shame in that. He didn't have the data we have now. One could say the same about Einstein. Do we throw out QM because Einstein didn't like it? No; because he isn't deified in the same way that your cult deifies Alfven. What you believe is nothing to do with science. It is the faith and dogma of cultists. Nope. The hexagon is a giant plug through which the aliens top-up the metallic hydrogen in the core. Yet he mentioned a plasma process, namely the Bennett pinch, which has nothing to do wth gravity. We know there are Birkeland currents entering the poles. We know the poles are "hotter" than expected. We know from maths modeling there will be counter rotating cylinders, observed. We also know Birkeland currents create diochrotron instabilities which creates polygonal patterns. This NOT a plasma density mass, it's a dense atmosphere of matter. ... To continue to claim this is a "meandering jetstream" requires numerous related phenomena to be ignored and trivialized. I didn't claim it, the author of your link did. EM is the force in effect at small scale. Gravity takes over when larger accumulations of mass enters of the equation..
We don't need no stinkin' observations at the Sun. Lord help us if jonesdave and the other Luddites are physics majors - I can see them evolving to "proof? We don't need no stinkin' proof! We have a nice shiny mathematical model, so go away! Can't you see I'm tenured?" I wandered in a few days ago, so I'm still trying to figure out if this is a parody site. Does phys.org not have moderators? This "a science news aggregation site to let the masses get an idea of wha'ts being researched" site. No moderation evidence, at this point. What a train wreck of a thread, populated by an amorphous mass peddling 'electric' pseudoscience to the point of portraying science interested critics as 'trolls' and using a folk definition of observation instead of the statistical based science way. I am sure the anti-science brigade has sites where they find interested readers. Most people who read a science aggregating site is not only not interested, they think it is annoying. Also annoying is that the new discoveries is not discussed at all! From the article description, the absence of outer field tilt vs the orbital plane is not induced in the main dynamo, there is an upper layer adding local fields at best. The more interesting possibility - I am sure there are others - is that the extensive ring layers (such as Enceladus' jet originating water ice "D" layer) are forcing the outer field to the planet spin, ring, plane. Humorously, the religious acolytes of all things dark and maths care little about the fact that the observation falsified their maths based models of magnetic field creation. Instead they prefer name calling and willfully ignoring the facts in favor of their religious like beliefs. The hexagon is a giant plug through which the aliens top-up the metallic hydrogen in the core. Since there's virtually no tilt in the magnetic axis, It'll be very entertaining to see just what people invent to explain this phenomenon which basically kills off the dynamo theory. There's already on offer the tantalizingly stable magnetic fields at the upper level just above the liquid hydrogen surface....! Of course a theory will be formulated that unfortunately requires another probe visit to the planet - which will put the confirmation or negation out of reach for another, say 162 years at minimum, if it ever gets done given the turmoil we are experiencing here on earth right now.